ATLANTA — A business major at Clark Atlanta University, Delaina Mims said she spends at least eight hours a day at the Robert W. Woodruff Library. “It’s a good space and it’s better than being by yourself,” said Mims, who had just met up with three of her friends near the library’s outdoor promenade, which students call “Club Woody” because at night students sometimes play music there. Mims can mingle here with fellow students not only from Clark, but also from nearby Morehouse and Spelman colleges and the Interdenominational Theological Center. That’s because all four schools share the library. Three of the four belong to the Atlanta University Consortium, a nearly 90-year-old alliance under which these neighboring colleges and universities plus the Morehouse School of Medicine jointly offer services and space. It’s a model other schools are increasingly considering, to help reduce the rising costs of doing business by leveraging purchasing power and collectively operating everything from shuttle buses to security and from course offerings to classroom space. 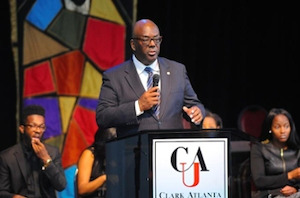 “Working together, we can raise productivity and lower out-of-pocket expenses,” said Dr. Ronald A. Johnson, Clark Atlanta’s president. Efforts to build alliances like this are especially growing among smaller private colleges that are heavily dependent on tuition and whose revenues and enrollment have stalled. The Higher Education Systems and Services Consortium, which encourages collaboration among private colleges to reduce costs, has grown from five members to nearly 100 in the three years since its founding, said Keith Fowlkes, the consortium’s cofounder and vice president. More than half of small, private colleges lost or failed to gain students last year, according to the National Association of College and University Business Officers. The number of private, nonprofit colleges eligible to award federal financial aid declined last year by 33, the U.S. Department of Education reports. Doing such things as purchasing collectively can save these institutions up to 25 percent on such pricey goods as energy and software, Fowlkes said. He said many still resist abandoning their independence. But for some, money problems have become so critical that they may no longer have the choice. Three or four have dropped out of his consortium because they couldn’t even afford the $500 membership fee, Fowlkes said. Such financial struggle is the major reason Michael Thomas, president of the New England Board of Higher Education, said he expects to see far more schools begin exploring such collaborations. “Nothing opens up an institution to the possibilities of change like a crisis,” said Thomas, who wrote a paper on the topic for the think tank the TIAA Institute. There are too many universities and colleges vying for a stagnant supply of students, Thomas said. Many of those should “run and not walk” to establish partnerships. Working together can also improve services to students, according to administrators at colleges that already do it. The Atlanta schools, for instance, get a far grander library by sharing the cost than they could afford individually, said Loretta Parham, the Woodruff Library’s director. “For what they pay on an annual basis, each school could not have 200,000 square feet and a collection of 1 million items,” Parham said. Through the consortium, members also offer cross-registration, allowing students at any of them to enroll for classes at another. They run joint career fairs, share property and casualty insurance plans, and are working on a shared digital procurement system, Johnson said. Most alliances are regional, a natural outgrowth of proximity in places such as Pennsylvania’s Lehigh Valley and around Amherst, Massachusetts. In Kingsport, a city in Tennessee’s northeastern corner, four public and private higher education institutions have together created a $12 million “academic village” in which they share space and offer degree programs. East Tennessee State University just joined the project this year, and 500 of its 14,000 students have enrolled at the site, said Dr. Rick Osborn, dean of continuing studies and academic outreach. Using the shared facility will save his school up to $18,000 this year on such costs as rent, utilities, security and janitorial services, Osborn said. Other collaborations are statewide. The Wisconsin Association of Independent Colleges and Universities and the Tennessee Independent Colleges and Universities Association, for example, focus largely on pooling the buying power of their members for everything from power to paper. Now alliances are going national. The TCS Education System is a nonprofit with offices in Chicago and San Diego that helps its five member colleges from different regions save on such costs as financing, marketing and legal services. This frees up funds for “student-facing services” such as new programs, which contribute to increasing enrollment, President Dr. Michael Horowitz said. Benefitting students is his organization’s main goal, he added. Pacific Oak and Saybrook colleges were both operating at deficits when they joined the alliance in 2010 and 2014, respectively, said Horowitz; they both now have growing enrollment, falling student-loan default rates and financial surpluses, he said. Such results are not necessarily guaranteed. The Colleges of the Fenway — six adjoining campuses in Boston’s densely settled Fenway neighborhood — collaborate on everything from security to intramural sports and the performing arts, and vastly enhance their academic offerings by letting students cross-register. There’s even a common ID card. But one of them, Wheelock College, nonetheless descended into such financial straits that it sold off the president’s house, put one of its dorms up for sale, and finally agreed to be acquired in June by much larger Boston University. And it’s still the case that far too many are thinking about, but not acting on the idea, he said.